Visualize the following: The Earth's climate swings between cold glacial and warm interglacial periods; the last glacial interval was about 20,000 years ago; sea level was about 126 meters (413 feet) below modern sea level at that time; and the Holocene, which represents the last 12,000 years of climatic change, is an interglacial period. The last interglacial period about 127,000 to 116,000 years ago was the last time sea level was as high as or even higher than present-day sea-level. Understanding sea level change during the last interglacial period, a time when the earth was slightly warmer the present, is an important research area for understanding future sea level rise due to global warming. The magnitude and trajectory of sea-level change during the Last Interglacial, more specifically Marine Isotope Stage (MIS) 5e, is uncertain. To date the consensus view has been that sea-level may have been six to nine meters above present sea level, values that require additional melting of Greenland and the West Antarctic ice sheet and that there was one or more oscillations of up to several meters superimposed. However, scientists at The University of New Mexico (UNM) and the University of South Florida (USF) and their international team of collaborators aren't so sure that those sea level fluctuations are accurate. According to new research published today, Monday, Sept. 10, in the journal Nature Geoscience titled, "A highly resolved record of relative sea-level in the western Mediterranean Sea during the Last Interglacial period," these scientists present a well-dated relative sea level record from the island of Mallorca in the western Mediterranean Sea for MIS-5e based on the occurrence of phreatic overgrowths on speleothems forming near sea level. "Globally, the climate was warmer by 1 to 2 °C during the part of the Last Interglacial Period referred to as Marine Isotope Stage 5e (MIS-5e) between 127,000 and 116,000 years ago," said Victor Polyak the first author and co-principal investigator and senior research scientist in the UNM Department of Earth and Planetary Sciences. "While this is a well-studied period, we still do not know the exact behavior of sea level during MIS-5e. What we know for certain is that sea level was higher when climate was 1 to 2 °C warmer 120,000 years ago. For this reason, the history of MIS-5e sea level is important as an analog for what will happen to current sea level with warming climate into the future." Until now, the best sea level markers were corals, because some species grow very close to sea level, and corals can be dated with the uranium-thorium method. Important reconstructions of MIS-5e sea level have been made from such coral studies. However, the scientific problem with coral is no one can ever be certain of how deep corals grow below sea level, and because they are made up of biogenic calcium carbonate, they are subject to alteration that slightly affects the uranium-thorium age measurements casting doubt regarding the accuracy of this method. "The best studies of MIS-5e sea level have suggested that sea level during this period was 6 to 9 meters above present sea level, and that there were likely significant drops during the MIS-5e sea level highstand," said Polyak. "This is alarming, because it suggests that if we warm our climate by 1 to 2 °C, we might cause sea level to rise 6 to 9 meters (20 to 30 feet). This could happen quickly causing sea level to be unstable." 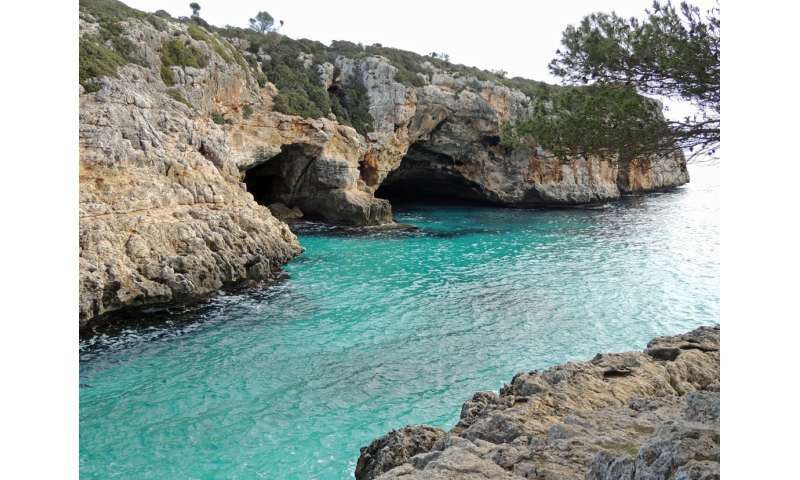 "The purpose of this research was to precisely reconstruct the sea level position during the last warm period, between 127,000 and 116,000 years ago, using some peculiar carbonate encrustations precipitated in littoral caves along the coast of Mallorca," says co-author and USF School of Geosciences karst geologist Bogdan P. Onac. "Most other known sea level studies for this period report elevations between 6 and 9 m—so we wanted to better understand the magnitude, timing, and stability of sea level, since such information is critical for future projections of sea level change under a 1.5-2ºC global warming scenario." Polyak, Onac, along with UNM Professor Yemane Asmerom, studied caves along the eastern coast of the Spanish island of Mallorca in the western Mediterranean. They utilized unique cave formations called phreatic overgrowths on speleothems (POS) that form naturally at the brackish cave water surface, which happens to be exactly equivalent with sea level in those caves near the coast. 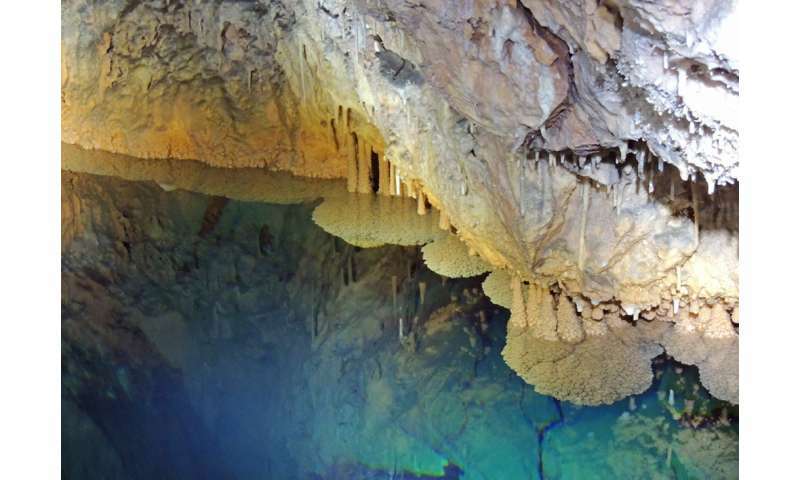 Phreatic overgrowths on speleothems form as carbon dioxide degasses from brackish cave water hydrologically connected to the Mediterranean Sea. "POS are well-preserved," said Polyak, "and given that they can be dated, they provide very accurate sea level elevations for current and pre-existing sea levels. They consist of inorganic calcium carbonate (calcite and aragonite) and are dateable by the uranium-thorium method. Unlike corals, they are not prone to alteration, and therefore the uranium-thorium dates are accurate. Another benefit of POS is that they will continue to grow as long as sea level is stable at a given elevation." Polyak and Asmerom dated 11 POS from eight different caves that exhibited POS at ~2 meters above present sea level. Forty-five uranium-thorium dates show that relative sea level remained stable. "This is the most accurate, best resolved sea level record for MIS-5e of the last interglacial period," said Polyak. "It provides exceptionally accurate timing of the sea level history during the above mentioned period and shows that it rose to 6 meters above present sea level ~127,000 years ago, it would have gradually fell to 2 meters by 122,000 years ago, and would have stayed at that elevation for the remainder of the sea level highstand to 116,000 years ago," says Onac. "The results suggest that if the pre-industrial temperature will be surpassed by 1.5 to 2°C, sea level will respond and rise 2 to 6 meters (7 to 20 feet) above present sea level." Dr. Hay (Boston College) corrected the relative sea level record for glacio isostatic adjustment using nine different glacial isostatic models. Together, these models suggest that ice-equivalent sea level in Mallorca peaked at the start of MIS-5e then gradually decreased and stabilized by 122,000 years ago, until the highstand termination 116,000 years ago. "One of the biggest obvious unknowns about the future is how much global real-estate we are going to lose to global warming and how fast it could happen," said Asmerom. "This is pretty awesome science; it's big stuff, global in scale. Beyond how high sea level is going to rise, we are also acutely in need of knowing how fast it will rise. "If you take the older data, in some cases the suggestion that's how sea level rise by nine meters by mere warming of two degrees would be catastrophic for our present configuration of cities and in some cases island countries. This work clearly shows the most important findings that sea level didn't just go up and down. You had small changes in temperature and sea level stayed pretty stable." The research reported in this study is the result of a collaborative NSF project in which USF is the lead organization. Field activities (cave visits for collecting samples and measuring their elevation), mineralogical, and crystallographical investigations on the mineral samples were performed by Onac at USF. "Although these are significant findings, there are many aspects of sea level change that need further exploration," said Polyak. "As a result, the UNM and the University of South Florida team was awarded a new National Science Foundation Grant to continue the work in the Mediterranean." What a wonderful idea! Measure the sea-level in the Mediterranean, and use it as a proxy for sea level in the world's oceans. The Med has higher evaporation rates than the oceans, so water constantly flows through the Straits of Gibraltar. As a result there is a net difference between the seal level in the Med and the oceans due to global temperatures and the water depth in the Strait. So a short term cool spell will raise the water level in the Med (relative to the oceans) and vice-versa. Is this more than a couple of meters one way or the other? Occasionally. If you visit Greece, you can see lots of underwater Greek villas which indicate that the current Med water level is relatively high.